The latest figures released and published in the Daily Mail suggest that British women are the the fattest in Europe, with British men coming second in the male competition. 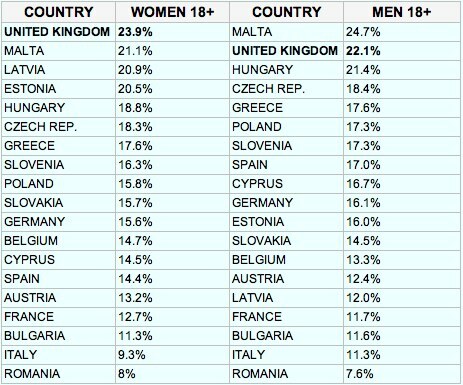 These figures although not a total shock are a bit of surprise – its a surprise that Britain has come first at something (although our men did finish second). What is also a surprise is that some of the other positions are filled with countries that you would not necessarily association with obesity. Malta’s women ran us close with the second highest obesity levels with Maltese men coming top of the pile with a staggering 24.7% – thats 1 in 4 Maltese men suffering from obesity. Other noteworthy mentions go to Greece with both men and women scoring 17.6% – although with the new austerity measures taking hold in Greece it is likely that these figures would improve over the next few months. Romania and Italy were the countries least affected by Obesity. Denmark, Ireland, Lithuania, Luxembourg, Netherlands, Finland and Sweden were not involved in the survey for reasons better known to themselves. Full fat league table below. The results are calculated and based on on the Body Mass Index (BMI), where the weight in kilos is divided by the square of the height in metres. A body mass index of between 18.5 and 24.9 is generally accepted to be considered healthy, while a measurement over 25 is overweight and higher than 30 indicates obesity. If the answer could be summed up in a short sentence it would read like this ..”Eat less food, consume less calories.” but of course that is easier said than done. With the new year around the corner why not start your resolution diet now.